It seems I can’t watch more than 20 minutes of golf or football without seeing an ad for Androgel to treat “Low T,” or low testosterone. The symptoms of low testosterone are very nonspecific, meaning they can come from many other things besides testosterone. While testosterone levels do decline somewhat with aging, an otherwise healthy man should not notice any ill effects. Older otherwise healthy men will have testosterone levels on the high end of the reference range. On the other side, diabetes, sleep apnea, and obesity are all associated with depressed levels of testosterone. Often (though not always), addressing the underlying cause can remedy the problem. More men are on testosterone therapy than ever before, and there is a very reasonable argument that this treatment is being used too indiscriminately and without real discussion of the possible adverse effects. 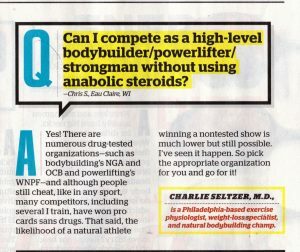 Check out my recent comments regarding anabolic steroid use in Muscle & Fitness magazine. There is data (although I believe it is weak) that testosterone replacement increases the risk of heart disease and stroke. There is also data which links low testosterone to premature death and an increased risk of prostate cancer. Again, we see opposing viewpoints from different medical schools of thought, and it seems like common sense has gotten lost in the mix. I have studied the literature, and I do believe in testosterone replacement therapy for appropriate candidates. However, if someone is complaining of fatigue and reduced exercise capacity, is 50 pounds overweight, doesn’t sleep and consumes four beers a night, the likelihood of issues stemming from low testosterone is pretty low. At the same time, if his testosterone level is low and replacing it allows him to follow a sound nutrition and exercise program, which results in improvement in blood markers of cardiovascular health and insulin status, the risk-benefit ratio changes. I would never write a patient a script for testosterone and say come back in 3 months. I would prescribe it to compliment a complete plan which addresses all aspects of health, not just one hormone. 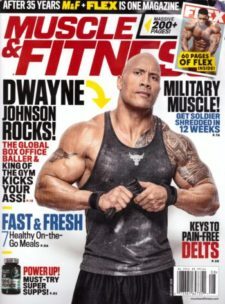 Despite what the commercials say, you are not going to lose your growing belly by taking testosterone. If you are fatigued and apathetic because of low testosterone, then you can, however, increase your odds of losing your belly by using testosterone along with proper nutrition, exercise, and lifestyle management plan. As always, please consult a medical professional before starting any hormone therapy.